When I create, I’m after the surprise. I gather the materials du jour and off I go. One thing leads to another, which leads to another, and so on. The path is unpredictable in both length and course, sometimes veering off radically on a whole new tangent. Serendipity is my cohort and directs the way. On a “good” creative day, there will come a moment of “Aha! There it is!” - a somewhat hard to define sense of recognition that what I was seeking has been found. If I’m super lucky, it will be close to done, but usually hours of refinement follow. So I’ve had it in my head for awhile to play with stitching as a drawing tool, letting the loops and curls take on a life of their own. I chose acetate so the threads on the backside would be visible and thereby add interest. 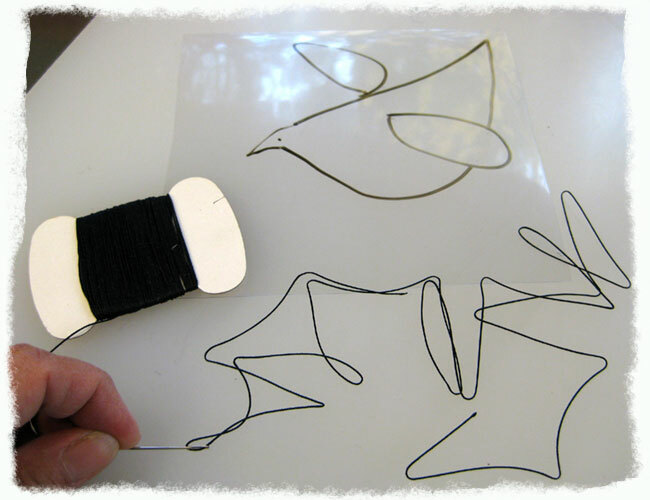 I quickly drew a simple bird outline in marker and unearthed some silk thread leftover from my days of making jewelry with painted copper, plexiglass, and silk thread (some 25 years ago). 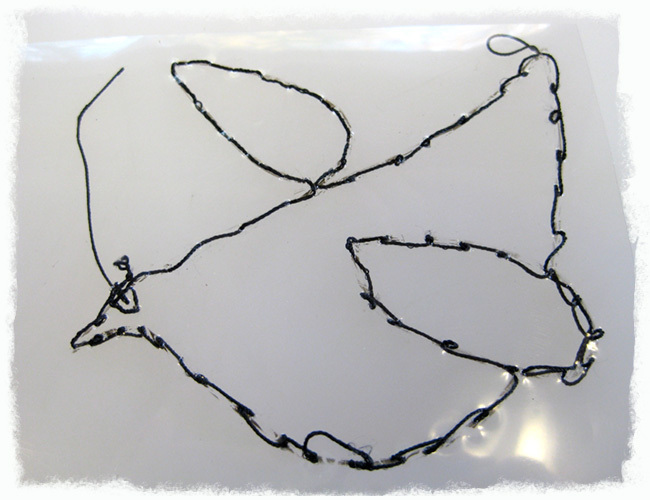 I was briefly sidetracked by the cool formations made by the thread as I unraveled it. Thinking these would be interesting to incorporate in future work, I scanned a series of these “thread compositions” before continuing. Once past the challenge of threading the needle (gosh, that used to be way easier! 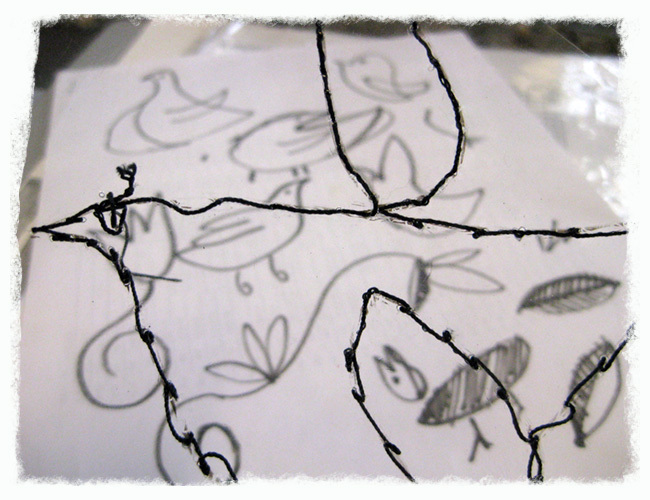 ), I sewed away following the outline, intentionally leaving loose stitches and loops. I decided straight and even would be too boring and wanted to maximize the energy and character of the line. 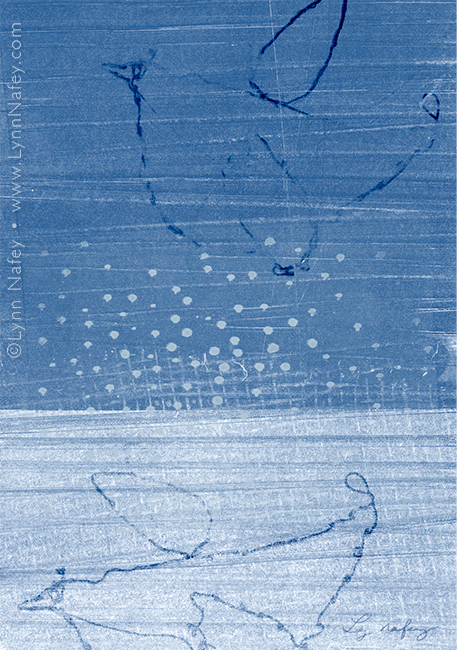 After scanning, I combined this sewn bird with other textures in a digital collage using Photoshop to blend and color. While playing around with various combinations and compositions, I placed a copy of the bird near the bottom of my layout. It was then that I got my “aha” moment and the image took on a magic of its own. This "aha" came rather effortlessly compared to most. I chalk it up to the fact that I was just “noodling” and had intended to “get serious” about the piece another day. As is often the case, the best stuff happens when you’re not trying so hard. The moment when an image comes into own and adds up to more than the sum of its parts is a mysterious, hard to explain, and sometimes elusive occurrence, not unlike a dream with its nonsensical juxtapositions and hidden meanings. It is a realm where logic steps aside and intuition and serendipity pave the way to surprise.